When you see the colorful and threatening face above, what response does this evoke? 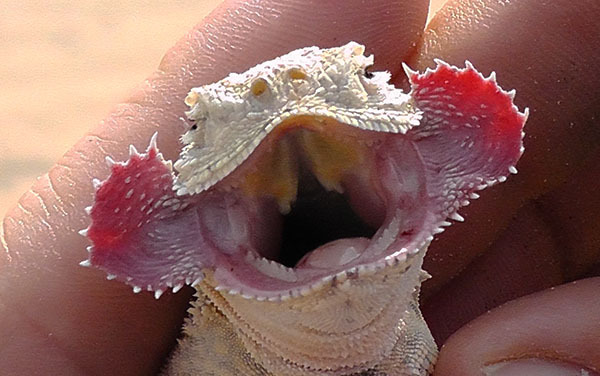 Imagine a lizard predator about to grab a lizard and suddenly it flares it’s cheek flaps and simultaneously presents an angry, gaping mouth. Why do they flare these cheek flaps and could they also play a role in sexual selection? These questions are of great interest to behavioural ecologists interested in animal signals and communication. We organized an international team including Martin Whiting and Daniel Noble from the Lizard Lab (Macquarie Uni.) in Sydney, and Yin Qi from Chengdu Institute of Biology, Chinese Academy of Sciences, to answer these questions and others that relate to the evolution of complex signalling in the toad-headed lizard genus Phrynocephalus. We also had the able assistance of Dr. Feng Xu from the Xinjiang Institute of Ecology and Geography, Chinese Academy of Sciences. We conducted this work in the Tukai Desert just outside Huocheng, Yili, near the bolder between China and Kazakhstan. We tested several hypotheses on the function of display signals including an anti-predator function where the lizard might try and bluff its size and fighting ability, social function, or that it acts as a flash signal (a different anti-predator function). We conducted a large series of trials using small enclosures we assembled in the field and by also using tethering, where a loosely restrained lizard is presented to a free-ranging individual in the wild. We had never worked with this species before and there is very little published about its behaviour and ecology. Consequently, we conducted a series of pilot studies to work out the best approach in which we would be able to elicit a beahvioural response. We also measured the colour of the flaps using a Jaz optic spectrophotometer and this will allow us to model the conspicuousness of the signal in relation to a bird predators visual system. In the end, we were able to catch 92 lizards which means a rather handy morphological data set to examine variation in colour and sexual dimorphism. Our experiments revealed some surprising results and all will be revealed when we publish this work! The Tukai Desert was a bit of an oven and this meant a somewhat short activity period for the lizard. Ironically, the days are long and we cant say exactly when the sun came up because we were generally asleep (maybe 6 am?) but the sun only went down at 1045 pm (China standard time)! As you may have gathered from Martin’s previous post, security in Huocheng is tight! The government police, the forest police, and the border police all paid their respects to us, copied our documents, and interviewed me extensively! It seemed they knew our every move! And they thought nothing about ringing me to ask questions mainly about Martin (you cant trust foreigners)! Stay tuned for an upcoming post on the reptiles of the Tukai Desert. We will also post some photos of the amazing Phrynocephalus in full display mode, with some accompanying video. This is Qi Yin signing out from the Urumqi Airport in northern China where their secrity team just gave us a serious work-over!